Donald Trump has scheduled a "Victory Party" as he and rival Hillary Clinton fly up and down the eastern United States in a marathon final 24 hours to seal the presidency. The Republican's campaign will host the "Donald J. Trump Victory Party" at the New York Hilton in Midtown Manhattan the night of the 2016 election 8 November. The party is invitation-only for friends and supporters of the Trump-Pence campaign. Just a couple blocks away near the Lincoln Tunnel, the Clinton campaign will host the "Hillary for America Election Night Event" inside the Javits Center. Before either of the candidates can celebrate, however, they are making rapid-fire appearances at places they see as key to capping their campaigns. Clinton is making a final push for support after being cleared Sunday by the FBI in an probe of her email practices. Trump will appear at rallies in Florida, North Carolina, Pennsylvania, New Hampshire, and Michigan on 7 November as he seeks to tip the balance and rally the vote in key swing states. 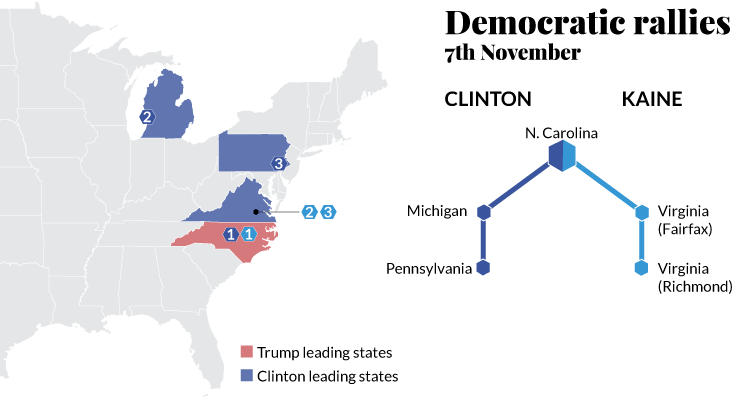 Right now Trump has a 1% lead on Clinton for electoral college votes in Florida and North Carolina. When it comes to the popular vote Trump and Clinton are tied in Florida and Trump is up five points in North Carolina. But new numbers from CNN also show Clinton edging him out with a five-point head in Pennsylvania and three-point lead in New Hampshire, where he will be campaigning. Clinton is also leading by five points in Michigan too and seems to have locked the electoral college vote for each of these states. Flanked by President Barack Obama and First Lady Michelle Obama, Clinton will appear Monday evening in Philadelphia, Pennsylvania, with special guests Bruce Springsteen and Jon Bon Jovi for a final campaign rally. 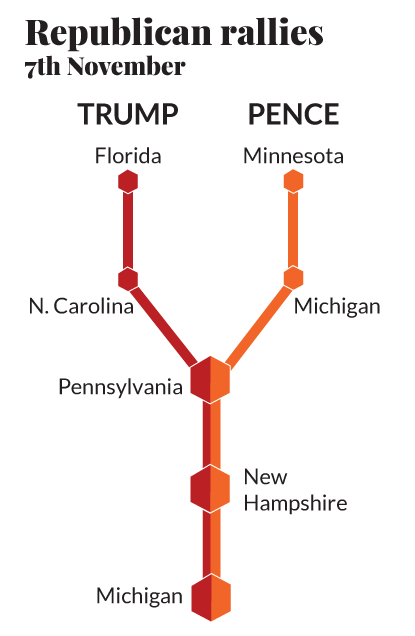 Through the day she is also making stops in North Carolina and Michigan. 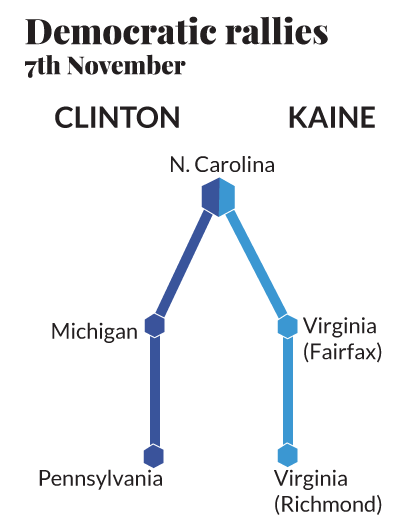 Seven of nine polls released today (7 October) show Clinton in the lead following news Sunday that the FBI did not find any new evidence to support a prosecution in her handling of emails while US secretary of state.